We are what we call “architectural determinists.” We don’t know if there is such a term, but it aptly describes our belief that our attitude, behavior, and odds of success are, to a great extent, heavily influenced by our physical environment. Michael originally studied architecture at UC Berkeley. During that short introduction to the curriculum, he became patently aware of the fact that people were influenced by their surroundings. Sociologists have told us for years that children are particularly effected by their environment. We like to say, it’s harder to act out when you’re wearing a tuxedo. Clear the decks for battle! We’re not suggesting that folks all dress like penguins or move into palaces to be successful. We started out in the laundry room in an old ranch house that leaked when it rained. But there was one thing we both agreed on right from the start. Wherever we lived and wherever we worked was going to be clean and orderly. We knew that a messy environment was not going to help us overcome the messy challenges we all face in business. Every once in a while, when things get especially hectic, we’d slack off on the clean and orderly bit. It didn’t take long before we’d start to get confused and downright discouraged. The good news was that we knew there was something we could do to make a difference. It would only take a few hours, or in the worst case, a few days. Getting our surroundings back in order always give us the feeling of having a fresh start. That in itself was encouraging. It didn’t solve our problems, but it did allow us more clarity and better focus. It gave us optimism. The old Navy captains would shout the command, “Clear the decks for battle!” That should be the mantra for this time of year as we finish one year and prepare for the next. 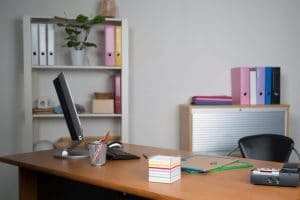 This is a great time to clean up and reorganize your office. It’s something you can do that shows a commitment to the future, gives you an immediate psychological boost, and will pay dividends in the year ahead. Why not schedule one of those days you plan on taking off for the holidays and give yourself the precious gift of order and peace. Get out a few large garbage bags. She believes most of the mess you’re cleaning up is trash. Get out several empty boxes. She believes a lot of what you’re looking at can be gifted to others. Pick up the first item and look at it. Do you really need it? If so, clean it and put it back. Can it be donated? If so, put in in the donation box. The idea here is to not put it down until you’ve decided which of the three places is its new home. Repeat. Pick up each item and make the same determination until you’re done. Then call the Goodwill and take out the trash. Put on some mellow music, enjoy a favorite beverage and gloat! Now you’re really ready for the New Year! Happy Holidays everybody!